This article is about the men's team. For the women's team, see Guinea women's national football team. The Guinea national football team, nicknamed Syli nationale (National Elephants), is the national team of Guinea and is controlled by the Guinean Football Federation. They have never qualified for the World Cup finals, and their best finish in the Africa Cup of Nations was second in 1976. The team reached the quarter-finals in four recent tournaments (2004, 2006, 2008, 2015). Guinea made their footballing debut in an away friendly on 9 May 1962, losing 2–1 against Togo. In 1963, Guinea entered its first qualification campaign for an Africa Cup of Nations, the 1963 tournament in Ghana. Drawn in a two-legged qualifier against Nigeria, Guinea drew the first leg 2–2 away on 27 July, and on 6 October won 1–0 at home to win 3–2 on aggregate. They were later disqualified for using Guinean officials in the second leg, and Nigeria went through to the finals in their place. In 1965, Guinea entered the qualifiers for the 1965 African Cup of Nations in Tunisia and was placed in Group A with Senegal and Mali. On 28 February, they lost 2–0 in Senegal before beating them 3–0 at home on 31 March, Senegal's win over Mali allowed them to qualify instead of Guinea. During the 1976 African Cup of Nations the Guinean team finished second to Morocco, only missing out on the championship by a point. In 2001, FIFA expelled the country from the qualification process of the 2002 World Cup and 2002 African Cup of Nations due to government interference in football. Momo Sylla was to blame for this. They returned to international action in September 2002 after a two-year ban from competition. In the 2004 African Cup of Nations, Guinea reached the quarter-finals, scoring the first goal against Mali before ultimately losing 2–1, conceding the winning goal in the last minute of the match. Guinea reached the quarter-final stage again in the 2006 tournament, taking the lead against Senegal before losing 3–2. 2008 saw Guinea reach the quarter-finals of the Africa Cup of Nations for a third successive tournament, only to suffer a 5–0 defeat against Côte d'Ivoire. In 2012, Guinea beat Botswana 6–1 in the group stage of the 2012 Africa Cup of Nations, becoming the first side to score six goals in an Africa Cup of Nations game since Côte d'Ivoire in 1970. The team subsequently exited the tournament at the group stage after a draw against Ghana. On 4 January 2016, CAF lifted a ban on Guinea playing their home international in Guinea after it was declared free of Ebola by the U.N. World Health Organization in December 2015. 2006 Africa Cup of Nations starting lineup. The following players have been selected for the 2019 Africa Cup of Nations qualifier match against Central African Republic on 24 March 2019. Caps and goals updated as of 24 March 2019, after the game against Central African Republic. The following players have been called up for Guinea in the last 12 months. 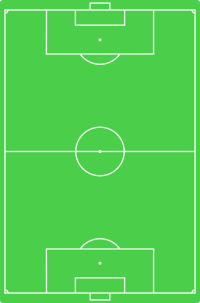 Players in bold text are still active with Guinea. ^ Barrie Courtney. "Guinea – List of International Matches". RSSSF. Retrieved 25 May 2014. ^ "Guinea – List of International Matches". Rec.Sport.Soccer Statistics Foundation. Retrieved 1 February 2012. ^ "Guinea: Country Info". FIFA. Retrieved 1 February 2012. ^ "African Nations Cup 1976". Rec.Sport.Soccer Statistics Foundation. Retrieved 1 February 2012. ^ "Fifa confirm Guinea ban". BBC Sport. 19 March 2001. Retrieved 18 January 2013. ^ "Guinea make their return". BBC Sport. 5 September 2002. Retrieved 18 January 2013. ^ "Mali squeeze through". BBC Sport. 7 February 2004. Retrieved 18 January 2013. ^ "Guinea 2–3 Senegal". BBC Sport. 3 February 2006. Retrieved 18 January 2013. ^ "Quarter-finals: Civ 5–0 Gui". BBC Sport. 4 February 2008. Retrieved 18 January 2013. ^ "Nations Cup: Guinea crush Botswana". BBC Sport. 28 January 2012. Retrieved 18 January 2013. ^ "Nations Cup: Ghana through after 1–1 draw with Guinea". BBC Sport. 1 February 2012. Retrieved 18 January 2013. ^ "Soccer-Guinea cleared to host matches after being declared Ebola-free". uk.reuters.com/. Reuters. 4 January 2016. Retrieved 4 January 2016. ^ "Syli National : les 23 de Paul Put pour affronter la Centrafrique" (in French). foot224.co. 14 March 2019. Retrieved 14 March 2019. ^ "Guinea Team 2019". national-football-teams.com. National Football Teams. ^ "Pascal Feindouno, le Zidane noir pour Piquionne". Guineefoot. Retrieved 12 February 2018. ^ Petre Moldoveanu who won the CAF Champions League in 1975 with Hafia Football Club was appointed manager of Guinea and led his side to the 1976 African Cup of Nations finals. Wikimedia Commons has media related to Guinea national football team.